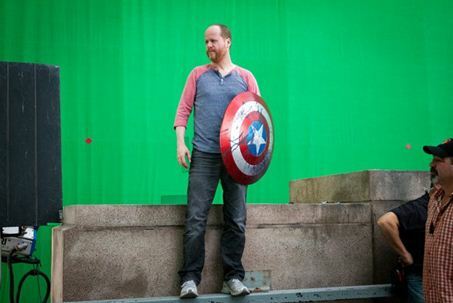 Writer/director/geek God Joss Whedon, has delivered financial and critical success with ‘The Avengers’. The achievement is now etched in the Hollywood record books as ‘The Avengers’ continues to haul in the cash and keep cinema receipt printers running out of paper. It’s amazing to see how many people have already seen the film two or three times (we’re up to three) and it has been a long time since a film has managed to inspire so many repeat viewings upon release. It seems Whedon has a very level head and has written a thank you letter to his fans over at Whedonesque (via Collider). Hit the jump the check out the response. Well, it’s been quite a weekend. Someday, long from now, I will even have an emotional reaction to it, like a person would. I can’t wait! But before I become blinded by this “emotion” experience, there’s a few things I’d like to say. Well, type. What doesn’t change is anything that matters. What doesn’t change is that I’ve had the smartest, most loyal, most passionate, most articulate group of — I’m not even gonna say fans. I’m going with “peeps” — that any cult oddity such as my bad self could have dreamt of. When almost no one was watching, when people probably should have STOPPED watching, I’ve had three constants: my family and friends, my collaborators (often the same), and y’all. A lot of stories have come out about my “dark years”, and how I’m “unrecognized”… I love these stories, because they make me seem super-important, but I have never felt the darkness (and I’m ALL about my darkness) that they described. Because I have so much. I have people, in my life, on this site, in places I’ve yet to discover, that always made me feel the truth of success: an artist and an audience communicating. Communicating to the point of collaborating. I’ve thought, “maybe I’m over; maybe I’ve said my piece”. But never with fear. Never with rancor. Because of y’all. Because you knew me when. So this is me, saying thank you. All of you. You’ve taken as much guff for loving my work as I have for over-writing it, and you deserve, in this our time of streaming into the main, to crow. To glow. To crow and go “I told you so”, to those Joe Blows not in the know. (LAST time I hire Dr. Seuss to punch my posts up. Yeesh!) Point being, you deserve some honor, AND you deserves some FAQs answered. So please welcome my old friend and certainly not-on-my-payroll reporter/flunky, Rutherford D. Actualperson! Head to Whedonesque for the “FAQ”.